Small Business Success Stories are quarterly sessions that will feature successful small business owners sharing their stories about how they built their businesses. Afterward, attendees can meet with the presenters for one-on-one sessions and advice. The luncheons are open to the public and are $15 for members and $20 for nonmembers. RSVP is required by Feb. 12 here. Small Business Success Stories are sponsored by Tedford Insurance. This session will feature Heather Turner, owner and founder of Anthem Road Academy. Anthem Road Academy Jenks opened in November of 2011 in its current Main St. Location. Once it filled to capacity, Anthem Road Academy Bixby opened June of 2015. 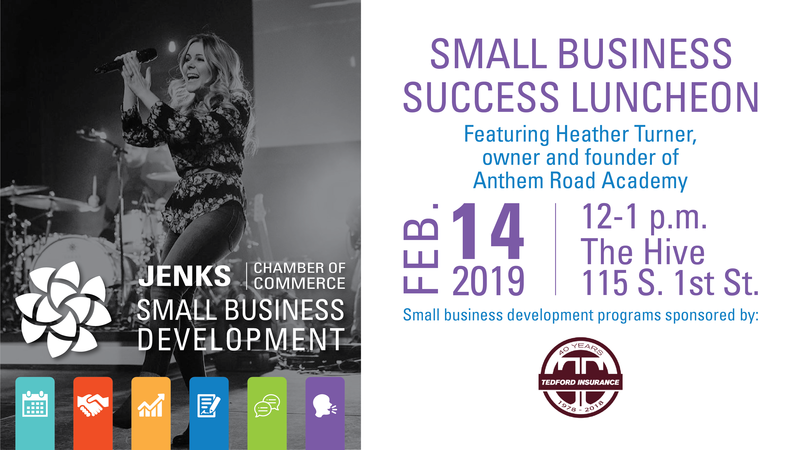 Anthem Road Academy is a member of Jenks Chamber and Bixby Chamber, Bixby Optimist Club, Jenks Public Schools Foundation and a sponsor and supporter of many local education and charitable foundations. Biography from Anthem Road Academy’s website.